I wrote about The Good Wife earlier this week, but noted that I had seen just the first third of the season. I finished the rest in about a week and a half. Why? I’m not really sure. I don’t really understand why people love it so much, but I had it on my computer, so damn well, I apparently decided I’d get through it. Will I ever watch the remaining seasons? Only time will tell. Now, a couple of quick thoughts I had during the rest of the season. The firm is going through hard times, as is the rest of the legal world, the show tells us a million times. Senior partners Gardner (Josh Charles) and Lockhart (Christine Baranski) are looking for a third partner, after they break off with their original third partner early in the season. Amongst the choices are Clinton adviser and famous 90s-political figure Vernon Jordan, who actually makes a 20 second speaking appearance on the show. 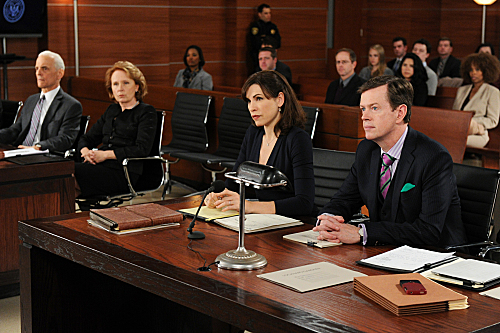 Did you know the firm in The Good Wife is undergoing layoffs? If you watched any three minute segment of the show, you know, because they announce it about a thousand times. Times are tough, and everybody needs to watch out because layoffs are coming! Again, an obsessive TV fan like myself truly appreciates the who’s who of minor tv actors and actresses, in which this show seems to out law & order even Law & Order in this respect. Among the actors and actresses appearing in more than one episode are True Blood’s waitress Arlene, as a lawyer, Royal Pains’ Jill Flint as a recurring FBI agent who apparently as a thing with Kalinda, Raising Hope’s Martha Plimpton as an attorney, Gary Cole as a conservative ballistic expert with a thing for Christine Baranski, Oz’s Terry Kinney as a contractor who might testify against Alicia’s husband, The Wire’s Chris Partlow, Gbenga Akinnagbe, as a pastor advising Alicia’s husband (The Wire’s Commissioner Burrell, Frankie Faison, plays his dad) and just so many more. Dylan Baker (fantastic character actor, and Zeljko Ivanek contender who appeared as Lena Dunham’s father in Girls and Katherine McPhee’s father in Smash just this past year, and was also Curt Connors in Spider-man 2 and 3 as well as many other roles) plays a sexually adventurous hyper rich possible killer of his wife and a stalker in two separate episodes in the first season, which is far and away the most out there plot of the season, and which feels like it is has no place in this show. The Good Wife is hardly grounded in reality, but it’s mostly not this sensational either. It really seems like something out of The Practice, where defending a possibly deranged serial killer was the subject of at least one out of every three episodes. I had known the show was filmed in New York and not in Chicago, where it’s set, and often the streets look largely like New York, but in one scene I straight out saw a Brooklyn street sign, Flatbush and St. Marks. Oops. I’m sure I was just about the only one who noticed, and then went back to confirm, but still. In every other episode, even though 90% of her clients are the “good guys,” Alicia Florrick gets this disgusted look on her face and wonders if they really should be standing up for this or that client every time there’s a whiff of defending a guilty criminal, or a despicable corporation. Yes, for the 100th time – sometimes the guilty get off, Alicia – you have to zealously represent your client, you don’t get to impose your ethics, those are the rules. Here’s an idea – you can work for plenty of legal organizations that don’t do that kind of work, and forfeit your expensive salary, and then you can get to live with yourself ethically if that’s your issue.